The Department is committed to the safe and responsible hunting of game animals in NSW. Illegal hunting is discouraged and responses to illegal hunting will be proportionate. The primary purpose of regulatory measures is to encourage voluntary compliance with game hunting laws and to detect and deter illegal hunting on both public and private land. This policy provides the guiding principles necessary for a fair, safe, efficient and equitable application of game hunting laws in the day-to-day dealings of Game Licensing Unit (GLU) with stakeholders and the general community. Ensure transparency of operations for the Regulatory Authority. Maintain public confidence in the Department and the game hunting legislation it administers. Provide clarity and certainty for game hunters as well as for Department officers. Assist prioritisation and efficient use of resources. Regulatory compliance – Adhering to the requirements of laws, industry and organisational standards, codes and accepted community and ethical standards. Administering game hunting licensing services. Administration of the NSW Public Land Hunting Program and NSW Native Game Bird Management Program. Implementing and conducting compliance activities and enforcement operations. Developing and delivering hunter education and training programs. Administration of research into game and feral animal control. Support for the Game and Pest Management Advisory Board and administration of the Game and Pest Management Trust Fund. Under the Act and Regulation the Regulatory Authority is defined as the Secretary Department of Industry, Skills and Regional Development. This authority has been delegated to the Department of Primary Industry Game Licensing Unit (GLU). This policy summarises the GLUs approach to regulatory compliance. It explains how the GLU will conduct its regulatory functions to drive voluntary compliance and address instances of deliberate non-compliance. The GLU operates within a complex legislative and political environment that requires clear policy and the careful administration of resource’s to achieve the best outcomes for all stakeholders. To ensure that the GLU continues to deliver quality regulatory services that are outcomes focused and risk based it has adopted a modern regulatory approach (Figure 1, below). This approach seeks to drive behavioural change in NSW to maximise hunter safety, ethical conduct and voluntary compliance. It also seeks to identify and address instances of repeated non-compliance through the application of appropriate and proportionate sanctions within its delegated regulatory powers under the Act and Regulation. Proportionate to the risk posed by the legislative breach. Clearly defines its regulatory outcomes. Identifies and assesses risk that affect regulatory outcomes. Provides information to improve compliance for regulated entities. This policy applies to the operations of the GLU under the Act and Regulation. This policy does not include GLU Compliance Officer actions under the Forestry Act 2012. Actions and activities under this act are set and administered through the Forestry Corporation of NSW. It is the responsibility of the regulated parties, industry and community to comply with all relevant Acts and Regulations. The GLU takes a risk-based approach to regulatory compliance management. Where compliance with the legislation administered and enforced by the GLU is not achieved, there is a progression of tools in place to respond to non-compliance. While regulated parties are expected to comply with legislative requirements, if non-compliance is identified the likely consequence for the regulated parties are clearly identified, predictable and consistently applied. Regulated parties can expect that any non-compliance will be treated seriously by the GLU and will be dealt with in a professional manner. This regulatory policy is intended to describe the GLU’s overall approach to assessing and monitoring regulatory compliance and responding to instances of non-compliance. This policy aligns with NSW State priorities, NSW Department of Industry, Skills and Regional Development Corporate Plan, the NSW Department of Primary Industries’ Strategic Plan, NSW Fisheries Business Plan and the GLU Plan 2015-19. Promote compliance with the objective legislative provisions of the Act. Encourage the use of regulatory tools in such a way as to best achieve our organisational objectives. Have a risk-based approach to regulatory compliance through adoption of a graduated and proportionate response to non-compliance. The policy promotes a cooperative and collaborative approach with hunters, hunting organisations, hunting industry businesses and the greater NSW community to drive voluntary compliance with game hunting regulations through education, communication and stakeholder engagement. Game and Feral Animal Control Regulation 2012. The GLU also references the Guidance for regulators to implement outcomes and risk-based regulations (QRSI) to produce material that provides a clear and practical framework for regulators to implement outcomes and risk-based regulation. This approach aids the Branch in achieving improved compliance outcomes and regulated entities to tailor their activities and demonstrate compliance. The GLU collects data from its interactions with regulated and non-regulated entities and uses this data to inform decision making, as well as the allocation and prioritisation of resources to achieve strategic outcomes. The GLU's primary focus is targeted preventative operations. The GLU constantly improves its capacity to detect and respond to non-compliance. When a problem or a risk is identified, the GLU seeks to resolve the problem before it leads to further impacts on the community. Monitoring compliance and investigating non-compliance is therefore a key role for GLU. Figure 2 (below) shows the components of the GLU compliance approach. This enables the Unit to focus on identified areas of highest risk and learn and adapt to continuously improve the appropriateness, efficiency and effectiveness of its compliance program. It is identified that the most effective way to gain and maintain voluntary compliance is by building a relationship of trust between the GLU, hunters, the hunting industry and the community. Education - maximise standards for safety, ethics and sustainability. Setting appropriate standards - appropriate and proportionate legislative and licensing provisions. Support - maximise stakeholder engagement and communication. Compliance Monitoring - commit to monitoring high risk entities. Enforcement - is fair, proportionate and consistent. Moving beyond compliance - explore incentives for consistently compliant entities. Encourage voluntary compliance with game hunting laws by providing information and education to those seeking it and those already participating in game hunting. The community is consulted on hunting laws that are being reviewed or changed, where possible. Regulatory outcomes will be clearly defined and driven by short, medium and long term goals. Strategic partnerships with industries and stakeholders will be developed and maintained to improve compliance outcomes. The Department will be open and transparent with strategic partners to improve compliance outcomes. The community will be involved in solving compliance problems and reporting suspected offences against game hunting legislation where possible. Investigations will be undertaken impartially and enforcement actions will be applied in a manner proportionate to the severity of the breach of game hunting legislation or regulatory requirements. Enforcement will be undertaken and action applied in a consistent manner using lawful procedures, policies and clear standards. Expectations for compliance will be clearly articulated. Actions taken will comply with relevant guidelines issued by the Attorney General, the Department of Premier and Cabinet and other relevant authorities. Complaints about potential or suspected offences will be investigated and responded to wherever appropriate, within the limit of available resources. The GLU recognises that communication, education and support help interested parties to meet obligations and avoid inadvertent non-compliance. The GLU provides information in the form of guidelines, factsheets, booklets, brochures, newsletters and online content. The GLU also has a dedicated call centre to provide support on all GLU operations as well as dedicated support teams for specific programs (e.g. native game birds and education).The GLU also attends up to eight hunting trade show events per year to also provide critical compliance and education materials to a wide range of interested parties and stakeholders. Compliance Officers play an important role in informing and educating hunters of their requirements, as well as the consequences of non-compliance. In addition, the Branch ensures that participants have the opportunity to raise issues of concern and participate in workshops and discussion forums staged by the GLU. Where possible, the GLU will seek opportunities to engage with hunting stakeholders during the development of its systems and programs. Hunter LEAP (Learning, Education and Accreditation Program) - an education initiative comprising the NSW Hunter Education Course (R-licence pre-requisite), a firearms safety training course (approved by Police as a prerequisite for a NSW firearms licence) and a range of short courses and workshops. Shut the Gate on Illegal Hunting Program - a program designed to empower landholders to detect and deter illegal hunting and empower communities and other stakeholders to report illegal hunting. Specific education and awareness campaigns aimed at targeting illegal activity or safety concerns. For example GunSmart (the NSW firearms safety initiative) and the Hunt safe, Hunt smart be a responsible pig dogger initiative. GLU uses routine inspections and audits as a method of collecting information and monitoring compliance, particularly on State forests open for hunting. During these audits direct stakeholder engagement through covert and overt patrols and covert electronic surveillance using cameras is undertaken. GLU uses investigations as a key means of assessing reported or detected incidents or significant breaches of legislation to determine the priority for further compliance action. During an investigation, authorised officers gather evidence about the incident in order to establish whether an offence has occurred, the severity of the offence, and the identity of those who may be responsible. This evidence may take the form of videos, photographs and seized items and other forms of physical evidence, witness statements and records of interview, consistent with legislative powers. Identifies areas with a history of non-compliant practices. Identifies behavioural issues and use of compliance data to evaluate/review the regulatory strategy. Allocates resources according to risk. Clearly defines regulatory outcomes and identifies and assesses risks to achieving regulatory outcomes. Tailors its use of enforcement and other regulatory tools based on the severity and behavioural drivers of non-compliance. The GLU strives for a coordinated, transparent and accountable compliance system and recognises that the most effective way to achieve compliance is to involve regulated parties during the regulatory and policy development stage. Extending beyond regulatory and legislative development when the Branch is creating program-specific policies, consultations with stakeholders are undertaken to ensure transparency, openness and visible accountability. Compliance incentive can be an effective tool to encourage voluntary compliance. GLU is committed to the use of appropriate incentives to encourage voluntary compliance within regulated communities and will identify and implement incentives where appropriate. The Branch undertakes a range of pro-active, planned monitoring and inspection programs to determine the level of compliance within a regulated community. Inspections/audits carried out at regular intervals. Determined on the basis of the risk rating. Follow up audits or more frequent auditing of identified poor performers or high risk areas. Campaigns targeting a particular regulated community. Reactive monitoring and inspections are undertaken in response to, complaints, incidents or other intelligence information gathered. This is mainly conducted on declared public land. For private land, Police have been identified as the most appropriate reactive agency to respond to illegal hunting incidents. The GLU applies a risk-based approach to reactive monitoring. This allows the Unit to achieve the best outcomes and to minimise the burden on regulated entities that are found to be complying or have only minor non-compliance issues. The GLU assesses reports at the point of receipt based on information obtained from the complainant. All complaints are added to the GLU Compliance Database and used to assess priority areas. The following issues will be considered and balanced in making a decision as to the type of compliance action, if any, that applies. The seriousness of the incident, based on its actual or potential impacts on the community. The potential or actual risk of public harm caused by the incident. Voluntary action by the offender to mitigate any harm to the public from the incident and any mechanisms put in place to prevent a recurrence. Failure by the offender to comply with GLU requests, lawful directions or statutory notices. The offender’s history of compliance with the legislation and the frequency of offences committed by them. Whether the offender has made false or misleading statements about the incident. The culpability of the offender, including any mitigating or aggravating circumstances. Public interest and community expectation about the action taken to provide specific or general deterrence. Any precedent which may be set by not taking action. Statutory time limits for taking action. The legislative procedures and policy requirements, including potential rights of appeal. determine the level of compliance and trends in compliance. identify when, whether and what type of education responses or enforcement action may be required. identify where action may be required to avoid or mitigate public harm. detect instances of non-compliance in a timely manner. assess and prioritise risk and optimise an appropriate response. develop compliance programs focused on the greatest risk to regulatory outcomes. assess and review the effectiveness of its operations, education and programs. recommend or action appropriate compliance and enforcement actions. suspend or cancel licences when recommended by Compliance Officers. suspend or cancel licences when recommended by Compliance Officers or the Team Leader Compliance. authorise the use of reasonable force to gain entry to premises where identified. Director General, Department of Primary Industries. Deputy Director General - Fisheries, Department of Primary Industries. Compliance risk: the level of risk that non-compliance with game hunting laws may have on the Department's ability to deliver the objects of the Act and compliance outcomes. Enforcement: the response or penalty applied to non-compliance with game hunting laws. Game Licensing Unit Enforcement Policy. Game Licensing Unit Complaints Policy. Guidance for regulators to implement outcomes and risk-based regulation - NSW Department of Premier & Cabinet, July 2014. Game Licensing Unit Regulatory Strategy. Game Licensing Unit General Work Instructions. 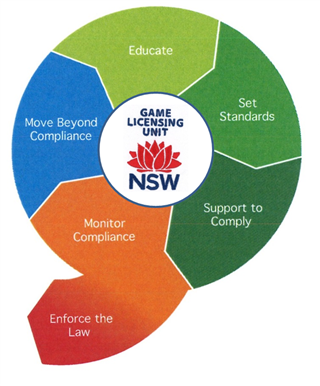 Game Licensing Unit Compliance and Enforcement Policy, December 2015.